fast Response time then our customers will be successful. 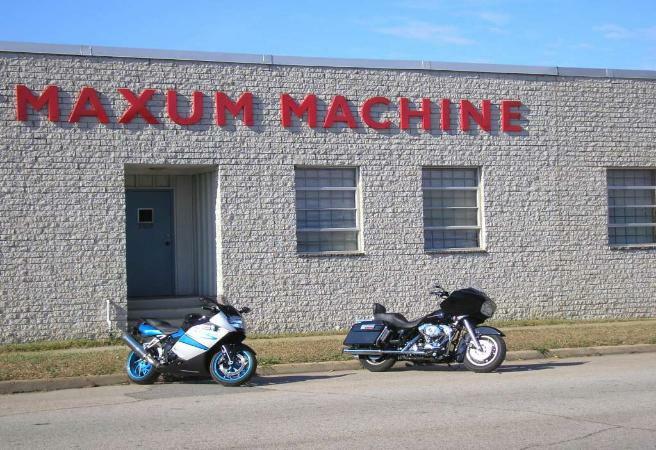 Maxum Machine, LLC was founded in 2005 by Mike Benini and Bob Kitson. Never underestimate the power of two wheels. BMW and Harley-Davidson and two people — Mike Benini and Bob Kitson. Mike and Bob worked together in a Richmond, Virginia machine shop for years. Mike ended up being a Project Manager for that shop and Bob left to work elsewhere. Bob came into Mike's workplace a few years later with a request for quote from his company. decided to pool their resources and set out on their own. shop were completed they officially opened Maxum Machine for business in June of 2005.
trusted source for full-service contract machining in the metro area and beyond. company with a good and well deserved reputation. changed some of it to suit the new venue. designed our new logo. Yes, we liked it so much we got T-shirts made. He really nailed it. Thanks to our customer and friend John Ryland of Classified Moto here in Richmond. aforementioned folks to get the job done. Thanks guys. Your help and input was invaluable.